Real Thai. Highly versatile. For sweet & savoury use. Gluten free. No artificial colours, flavourings or preservatives. 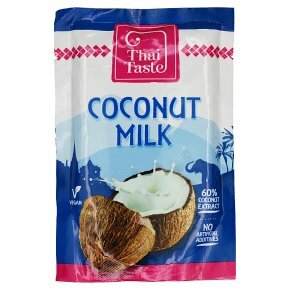 Suitable for vegetarians & vegans.Used widely in Thai cuisine to balance heat, coconut milk adds a mild and sweet flavour to any dish and is highly versatile, for using in both sweet and savoury dishes. Made from freshly chopped coconut flesh and water, it is also nutritious. Mix with Thai Taste Curry Pastes for a delicious Thai curry Shake well before opening. Not suitable for microwave cooking.